"Seven of Diamonds are a conundrum to themselves. They are simply both weird and wonderful. They carry the vibes of love and harmony because of their double portion of Venus energy. They also embody the influence of their karmic soul twin, the Nine of Hearts (the more serious twin) which has a double portion of Saturn (difficulty, seriousness, and boldness). 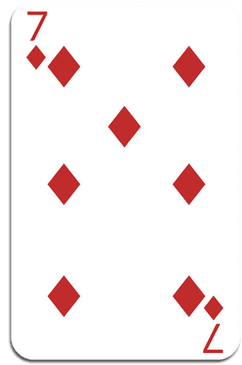 BTW, having a twin card is unique to only this pair of cards and one other pair (Ace of Clubs and Two of Hearts). Don’t you feel special?!? Seven of Diamonds learn from experience and tend to be late bloomers (that Saturn influence comes in around the age of forty-five). They have diverse career interests and have a weird collection of abilities. They should choose one and make as much progress as they can. And then choose again. And again. This colorful resume will give them an opportunity to build their internal foundation, which will help them hone their greatest gifts which will pay off later on in life. Invest in this development period. It sure to pay off, and maybe financially so. They have a spirit of adventure and the wisdom to see the world with a wide lense. They often give too deeply and are self-sacrificing when it comes to family, partners and friends. It may take a lifetime..."
*​​BTW: Leos (Sun-ruled) gleen insight from the Royal Archetypes (included below). ​Pisces, you have a Planetary Ruling Card that IS one of your Royal Archetype Cards (King of Diamonds). That report is included in the Kit below.